Among Pizzetti’s pupils, the most distinguished was Mario Castelnuovo-Tedesco, scion of a Jewish banking family in Florence. The Sonata quasi una fantasia, Op 56, was composed in 1929, with a dedication to the Hungarian violinist Adila Fachiri (who was also the dedicatee of Bartók’s two violin sonatas). The autograph manuscript formerly in Adila Fachiri’s collection is dated 30 October 1929, and it appears that she played the piece shortly afterwards: an announcement in The Times (18 November 1929) stated that on Saturday (23 November), ‘Miss Adila Fachiri will give a violin recital (Wigmore Hall) at which she will play a new sonata by Castelnuovo-Tedesco’. However, it is likely that this didn’t take place as planned, since a subequent announcement appeared on 24 February 1930, promising the same ‘new sonata by Castelnuovo-Tedesco’ in Fachiri’s forthcoming Wigmore Hall concert on 1 March. This performance—possibly the work’s first—was reported by the Italian periodical Musica d’oggi: ‘Castelnuovo-Tedesco’s Sonata quasi una fantasia has recently been played in London with excellent results by Adila Fachiri and the pianist Maurice Cole.’ Even though the sonata was published by Ricordi in 1930, it seems to have attracted little interest from performers. But after Castelnuovo-Tedesco was forced by rising anti-Semitism to flee Italy for the United States, he found this very piece being ridiculed in the journal Modern Music as ‘a variegated assortment of left-over impressionisms, chord streams, lush moods, chinoiseries, and “motives”, thrown together in a half-baked manner’. This was an extraordinarily harsh verdict on a work that is both harmonically alluring and quite concise, lasting just over quarter of an hour. The three linked movements are a Prologo marked Moderato e pensoso (ending with a magnificent flourish, with rising violin semiquavers and a double glissando in the piano), leading to the second movement, a lively Intermezzo, Vivace e danzante, with a slower central section, and finally an Epilogo, Calmo and marked cupo e grave (‘dark and serious’), which later returns to the tempo of the Prologo before a delicately coloured coda (with a fleeting reference to the Intermezzo) brings the work to a peaceful close. Le plus éminent élève de Pizzetti fut Mario Castelnuovo-Tedesco, descendant d’une famille florentine de banquiers juifs, qui composa sa Sonata quasi una fantasia op.56 en 1929. La violoniste hongroise Adila Fachiri semble avoir joué cette œuvre (qui lui est dédiée, comme deux sonates pour violon de Bartók) peu après la date du 30 octobre 1929 mentionnée sur le manuscrit autographe, conservé autrefois dans sa collection: le 18 novembre 1929, une annonce parue dans The Times proclamait que le samedi (23 novembre) «Miss Adila Fachiri donnera un récital de violon (Wigmore Hall) au cours duquel elle interprètera une nouvelle sonate de Castelnuovo-Tedesco». Quelque chose dut clocher car, le 24 février 1930, une annonce parut, qui promettait la même «nouvelle sonate de Castelnuovo-Tedesco» dans un concert à venir de Fachiri, au Wigmore Hall, le 1er mars. Le périodique italien Musica d’oggi publia une critique de cette interprétation—peut-être la première de l’œuvre: «La Sonata quasi una fantasia de Castelnuovo-Tedesco a été jouée voilà peu à Londres, avec un excellent rendu, par Adila Fachiri et le pianiste Maurice Cole.» Malgré une publication chez Ricordi en 1930, cette pièce semble n’avoir guère éveillé l’intérêt des interprètes. Après que l’antisémitisme grandissant l’eut contraint à fuir l’Italie pour les États-Unis, Castelnuovo-Tedesco découvrit pourtant que le journal Modern Music la tournait en ridicule: «Un assortiment bigarré de restes d’impressionnisme, de flots d’accords, d’atmosphères luxuriantes, de chinoiseries et de “motifs” amalgamés dans un bricolage à la noix.» Un verdict extraordinairement sévère pour une œuvre harmoniquement séduisante et très concise—à peine plus d’un quart d’heure. Les trois mouvements liés sont un Prologo marqué Moderato e pensoso (terminé en une magnifique fioriture, avec des doubles croches violonistiques ascendantes et un double glissando pianstique), menant à un Intermezzo enjoué, Vivace e danzante, doté d’une section centrale plus lente; enfin, un Epilogo, Calmo, marqué cupo e grave («sombre et sérieux»), renoue ultérieurement avec le tempo du Prologo avant qu’une coda subtilement colorée (elle renvoie fugacement à l’Intermezzo) ne vienne paisiblement clore l’œuvre. Der bedeutendste Pizzetti-Schüler war Mario Castelnuovo-Tedesco, Nachkomme einer jüdischen Bankiersfamilie aus Florenz. Die Sonata quasi una fantasia op. 56 von 1929 ist der ungarischen Geigerin Adila Fachiri gewidmet (die auch die Widmungsträgerin der beiden Violinsonaten von Bartók ist). Das früher zur Sammlung von Adila Fachiri gehörende Autograph trägt das Datum des 30. Oktober 1929; und offenbar hat sie das Stück kurz danach gespielt: eine Notiz in der Times (18. November 1929) besagte, dass am Sonnabend (23. 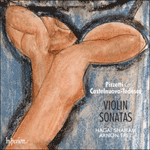 November) „Miss Adila Fachiri ein Violinrecital (in der Wigmore Hall) gibt, bei dem sie eine neue Sonate von Castelnuovo-Tedesco spielen wird“. Allerdings kam es wahrscheinlich nicht wie geplant dazu; am 24. Februar 1930 erschien nämlich eine weitere Ankündigung, mit der dieselbe „neue Sonate von Castelnuovo-Tedesco“ in Fachiris bevorstehendem Konzert in der Wigmore Hall am 1. März in Aussicht gestellt wurde. Über diese Aufführung—möglicherweise die erste des Werkes—hieß es in der italienischen Zeitschrift Musica d’oggi: „Castelnuovo-Tedescos Sonata quasi una fantasia wurde kürzlich höchst erfolgreich in London von Adila Fachiri und dem Pianisten Maurice Cole gespielt.“ Obgleich die Sonate 1930 bei Ricordi erschien, hat sie anscheinend wenig Interesse bei den Interpreten gefunden. Nachdem Castelnuovo-Tedesco jedoch wegen des aufkommenden Antisemitismus aus Italien in die Vereinigten Staaten geflohen war, entdeckte er, dass gerade dieses Stück in der Zeitschrift Modern Music verspottet wurde als „buntes Sortiment aus veraltetem Impressionismus, Akkordketten, schwelgerischen Stimmungen, Chinoiserien und ,Motiven‘, und alles halbgar zusammengebraut“. Dies war ein außerordentlich hartes Urteil über ein Werk, das sowohl harmonisch reizvoll als auch mit wenig mehr als 15 Minuten Dauer recht prägnant ist. Die drei miteinander verknüpften Sätze sind ein Prologo, Moderato e pensoso (mit einer großartigen Fanfare aus aufsteigenden Sechzehnteln der Geige und einem doppelten Glissando des Klaviers am Ende), der in den zweiten Satz übergeht, ein lebhaftes Intermezzo, Vivace e danzante, mit einem langsameren Mittelteil sowie schließlich ein Epilogo, Calmo, mit der Bezeichnung cupo e grave („dunkel und ernst“), der später das Tempo des Prologo aufnimmt, bevor eine farblich fein abgestufte Coda (die flüchtig auf das Intermezzo verweist), das Werk friedvoll beendet.